Today's post is for those beginning bloggers who want their eyes to be opened and the bloggers who have had their site for years, but just aren't getting anywhere. 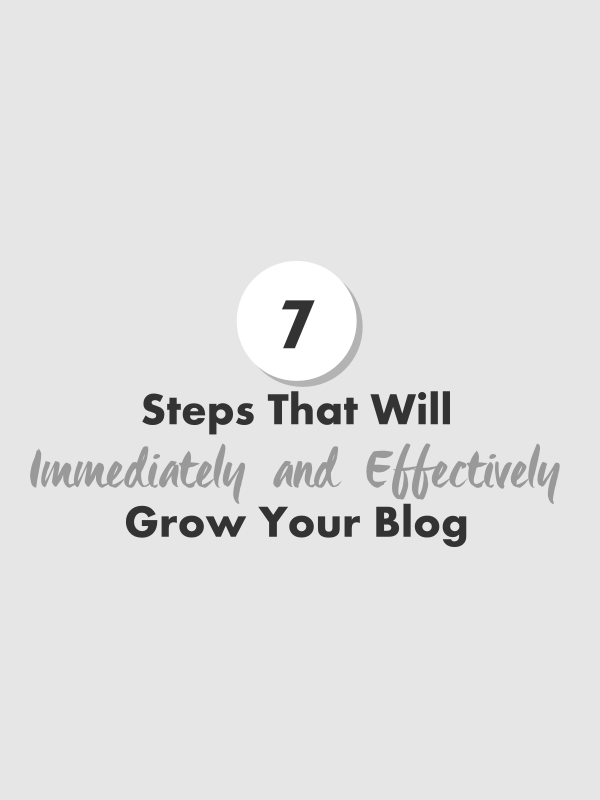 Here are 7 steps that will immediately and effectively grow your blog. What better way to get people flowing to your site, then to offer sending your posts directly into their inbox? Another way to get people to follow along is through Bloglovin'. Bloglovin' popularity has grown tremendously (and I'm sure not just with me personally), so offering it as a form of following will not only drive traffic to your blog, but increase your chances of getting shared, due to Bloglovin's super awesome features. You may have heard that in April, Google started shunning sites that weren't mobile friendly. Meaning, no matter how SEO friendly your blog is, there's no way it can get to the top of the search entries without having the added bonus of being nice to your mobile users. *sigh* As if you didn't already have enough work to do. For those of you not using the Blogger platform (or if you're using a custom Blogger template), this means you need a responsive theme. A responsive theme means that your layout adjusts to the screen size of the device your site is being viewed on. Whether it's being viewed on a smart phone or a desktop, your site will adjust seamlessly in response. Grab your mobile friendly template today! Have you ever liked a blog author so much that you felt the need to stalk them - or, at least, see what other amazing resources they have to offer? Maybe you liked one of their posts so much that you felt the need to share it with the world. Whatever the case, I'm sure your readers feel the same way toward your content, so share buttons and links to your social media are both two key counterparts when it comes to driving new traffic to your blog. The people who read your blog may want to find out more about you due to your helpfulness on the web or your sweet personality. And the people who follow you on social media may see your website link, click on it, and become an insta-fan (it's happened before!). This not only drives traffic back and forth between your social and your blog, but is a way of gently growing your readers and followers. Time and time again I've come across a website with an amazing resource with an ah-mazing graphic that would look stunning on my Pinterest - but they didn't have a share button. And because I'm lazy, I either bookmark the site and forget all about it, or worse - I leave it all together! In order to prevent this from happening to you, implementing share buttons into your post is a MAJOR MUST. Major as in you Must Absolutely Just Orient it Right now or else your gorgeous site is so not going to grow. Your content in beautiful. Your site's theme is beautiful. And who made it all happen? Why, the beautiful person behind the blog did, of course! Creating a bio page and allowing your audience to learn more about you is an essential. When people like something, they want to know who created it. They like to know that there's a fleshy, breathing organism doing all the work behind the scenes. So reward them with deets. Tell them a few of your quirks. Let them know you're human. From your content to your personality, readers are curious. When they're intrigued and engaged, they like to ask questions. They like to receive help. They like to know more. So give them your business or blog email and make sure to set up a page or specific section on your blog that says "Hey, I think you're cool and if there's anything I can do to help you, let me know, okay?" And be genuine about it. If I can spot the falsies from a mile away, your readers can too. Many times have I jumped to a site in search for something specific. And many times have I become frustrated when that wonderful site didn't have a search bar. When this happens, it's quite frustrating. Adding a search box to your site will relieve your readers from this irritation, and prompt them into coming back when they're in search of your exclusive information.